The first thing to understand is that given enough time and the right tools, any bike lock can be broken by a determined thief. However, most thieves won’t have all the right tools, and if you bike is locked up properly, in a suitable location, thieves will not have enough time undisturbed to break your bike lock. Nevertheless, it is worth considering investing in bike insurance (or adding your bike to your household insurance policy), especially if you have an expensive bike. When buying a lock, look out for the Sold Secure standard which you will find on the packaging of many. This is an independent stamp that comes in gold, silver or bronze denoting the time the lock will withstand varying levels of abuse by thieves. Buy a lock with at least a silver rating unless you want your lock merely to stop someone walking off with your bike. While other types of lock are listed below, and these may work better for some people, a good quality D-lock is by far and away the best balance of security and portability on the market. Combined with a lightweight cable loop to attach your wheels, this kind of security is likely to steer the casual thief’s attention away from your lovely new bike. This is a loop of high strength cable which is used in conjunction with a D-lock to secure the wheels of your bike as well as the frame. Although, on its own the cable is easy to cut, it adds as an extra deterrent to casual thieves – especially if you have quick release wheels. A determined thief with the right tools can open virtually any lock currently on the market. Fortunately most bike thieves aren’t as dedicated and well equipped. In fact, most bike thefts are crimes of opportunity. 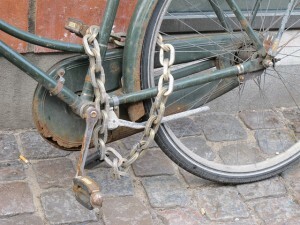 Here’s how to help encourage any would be thieves to take one look at your securely locked bike and move along swiftly. 1. Always lock your bike. Even if you are only leaving it for five minutes. If you can’t see it, someone could be stealing it. 2. Secure it to something strong. Your bike is only as safe as the object you lock it to – make sure that you lock it to something tough like some iron railings or a lamppost. Thieves don’t only cut bike locks. 3. Secure your bike by the frame – the most valuable part. 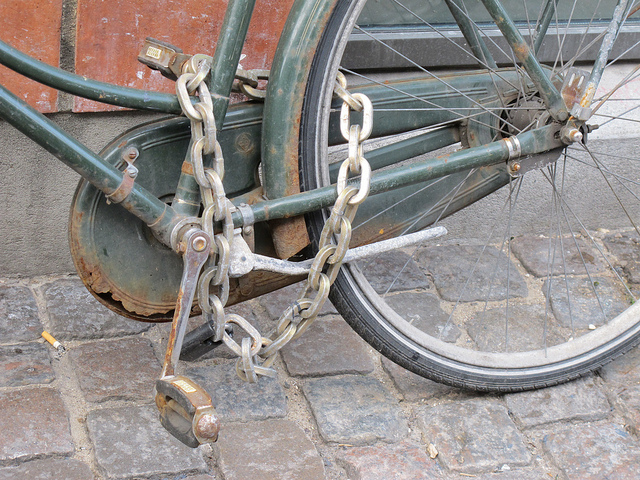 If locked by the wheel thieves can simply remove the wheel and take away the rest of the bike. 4. Lock your bike in a public place where there are plenty of people. The presence of others will put thieves off. 5. 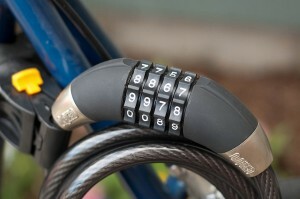 Lock your bike somewhere secure like a train station or in a closed off area at work. Thieves will be put off by a lack of a quick exit. 6. Make your bike more secure than the next bike. Thieves will make a trade off between the value of a bike and how easy it is to steal. If there is another bike similar to yours with less security, they will try to steal it instead. 7. Leave as little space as possible inside the loop of your lock. This leaves less space for a thief to insert a bar or other tool to lever it open. 8. Make the lock mechanism difficult to access. If you are having trouble getting your key in the lock, it will also be tricky for a thief to drill it. 9. Lock your wheels up – especially if they are attacehd with quick release skewers. 10. Don’t leave removable kit on your bike – like your lights and pump. Someone else may remove it. Is it really necessary to remove my wheels? It’s best to secure your wheels with a wheel loop – especially if they are quick release. Do i need to remove my saddle? If you have an expensive saddle with quick release, then yes. But for a bog standard saddle, thieves are unlikely to bother. The strongest locks around. 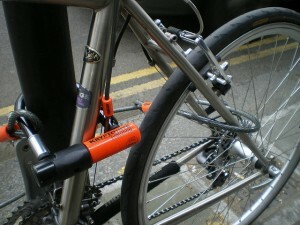 A solid D-lock with a good lock mechanism and armoured shackles is the best deterrent for bike thieves. However, D-locks are heavy – although these days most models come with a useful bracket to attach the lock to your bike. As with any lock, D-locks are only as effective as what you lock it to, and as D-locks are often quite small you will need to be able to find a suitable railing or bike stand to lock it to. Many D locks won’t accommodate a wheel as well, so if you have quick release, you may want to think about investing in a wheel loop – a loop of cable that fits through your wheels. All said this is the type of lock you want for your bike. As with any lock though, you get what you pay for – so spending a little extra bears dividends in the quality of the lock. 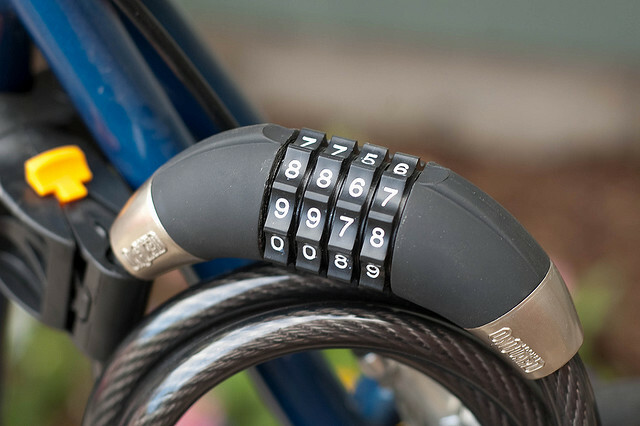 Think of it as an investment – as a good quality lock can last for many years and keep your bike as safe as possible. 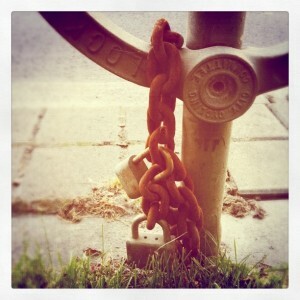 The only decent alternative to a D-lock is a high strength chain with a decent padlock. This type of bike lock can actually be heavier than a D-lock but allows a little more flexibility in what you can lock it to. It also enables you to lock up the wheel/s as well. However, chains are a bit cumbersome to carry and are difficult to attach to your bike. Cable locks are really only useful if you think no one want to steal your bike. Thieves will get through these in seconds, often without the use of any tools, just brute force. Useful if you just want to stop people riding away on your bike but no good against a determined thief.